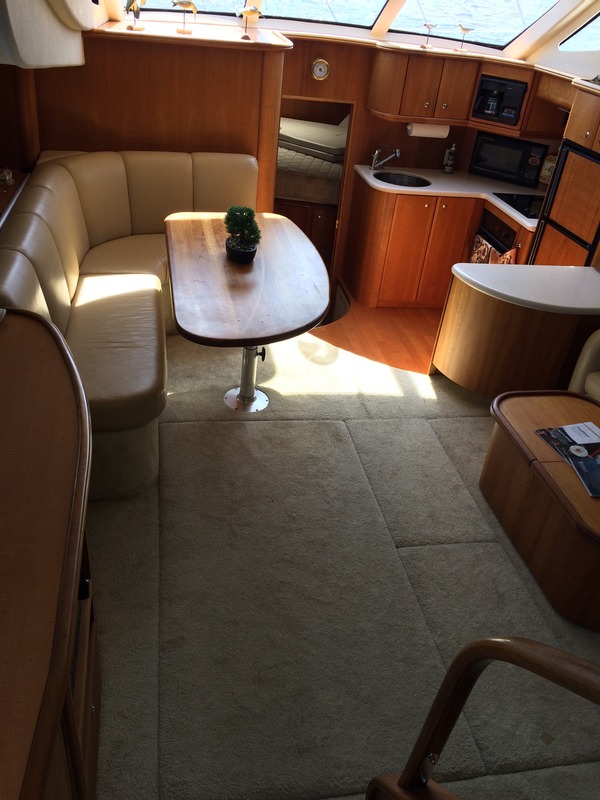 2003 Silverton 39MY with Caterpillar diesel engines 43’7” LOA. Beautiful design with innovative “Sidewalk” design that allows for full beam width (HUGE) salon and easy foredeck access from the bridge. The same design is used today. 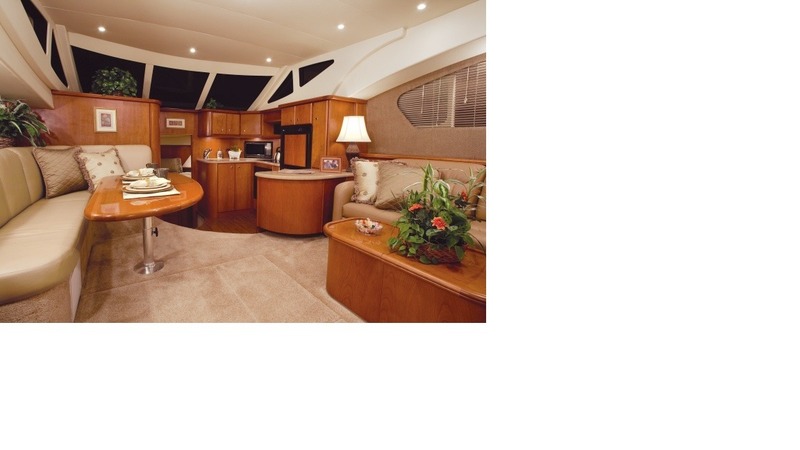 This yacht has all the options and is maintained by a meticulous owner. Manufacturer’s brochure http://dicksimonyachts.com/Brochures/Silverton/39-Motor-Yacht/39-MY-Brochure.pdf Yachting magazine review https://www.yachtingmagazine.com/silverton-39-motor-yacht/ Bridge, foredeck and aft deck: Simrad Autopilot (If you've never had one, you'll love it!) Furuno NavNet with 10” display (GPS / plotter / radar / depth sounder / speedometer) Flip-up bolster seating 13 hp Wesmar variable speed bow thruster Sprint anchor windlass Glendinning Cablemaster for shore power cord Bridge and aft deck enclosures VHF radio (intercom to salon also) Bow deck cushions Plow anchor with 250 ft chain Wet bar with icemaker on aft deck Washdown hose in anchor locker Swim platform shower and built-in ladder New deck carpet available Salon: Two staterooms with full bathroom in each Flexsteel furniture with Ultraleather surfaces Sleeps 6 with the jackknife sofa 3 Marine Air HVAC units with Digital Controls LCD tv’s in salon and owner’s cabin Toshiba FM/CD/DVD/VCR Bose Acoustimass 10 speaker system VHF radio in salon (intercom to bridge also) Jabsco electric macerating heads (fresh water) Water Heater – large 20 gallon capacity Central vacuum 1500 watt inverter Galley: Full oven 3 burner glass cooktop Microwave / convection oven Built in coffee maker 110v / 12v refrigerator Engine room: Twin 385hp Caterpillar 3126 diesels (1200 hours) Racor fuel filters (both engines and generator) Kohler generator 8kw with sound shield Oil X-Change-R System (makes oil changes a breeze) Recent service: Oil and filters changed 20 engine hours ago New engine, house and generator batteries summer 2018 New Isinglass for bridge and aft deck spring 2018 New upgraded battery charger Bottom painted spring 2018 with Petit SR-60 ablative paint Compounded and waxed Great boat slip also for sale at Cypress Landing Marina near Washington NC with an endless view down the Pamlico River. I’ll do a great deal for both the yacht and slip.